I’ve read several articles about Facebook’s EdgeRank algorithm changes and the negative effects on organic reach. 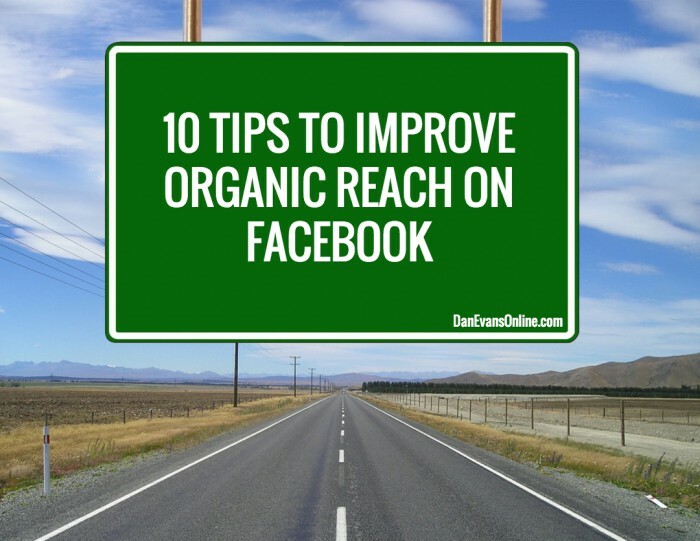 There are many businesses struggling to even get the slightest amount of organic post reach on facebook. I’ve spoken with my colleagues and most have reverted to paid advertising to get “likes” and boost posts. Essentially they’re buying more followers to temporarily boost engagement without fixing the problem. These tips can help you increase your organic reach and keep your tribe naturally by changing a couple of little things about how you approach your facebook strategy. As the community manager and trainer for 180+ local Marine Corps Facebook pages across the Western United States, also having coached several startups. I’ve narrowed down seven quick tips to share with you to increase visibility to your Facebook page followers. Maybe you’ve given up and determined your Facebook page is a lost cause. I challenge you to try these things and let me know whether or not these things are helping. I’m happy to take a look at your page if you leave me a link in the comments below. At a minimum you should be able to at least retain the users who are still actively engaging with your posts. 1. Post regularly, If you’re not posting daily to your page, unfortunately the page is becoming irrelevant to your followers twice as fast. If you’re not sure what to say, look at some other companies out there who are doing well. Schedule a Facebook to post every day especially on Holidays. These are little things to show your audience that “you care”. 2. Always look for an opportunity to include a photo in your post, visual posts are usually more engaging with audiences than text only posts. Keep the photo relevant to your brand and messaging though! 3. Don’t cut your post visibility from the get go. If you’re adding a link outside Facebook to another website such as a blog, youtube, or some other website; your post is getting visibility slashed from the get go.If you are posting an outside link to a video, I like to take a screenshot of the YouTube video and use it as your post photo. Here are some other tips to get around links and forming a quality post. 4. First, upload a good photo on your post to support your link. I like to use Canva to make a nice graphic, and Snapseed with the Phonto app to include a text layover quote on a picture if I’m away on my mobile phone. 5. Add 2-3 concise sentences of copy and include any relevant hashtags. Add the city of your event, the topic or organization you’re representing, many events have their own hashtag so organizers can track conversations across multiple channels. This allows people looking to become apart of your conversation to easily find your post using graph search or hyperlinks from your hashtag on mobile devices. 6. Use a shortening tool to add an external URL link, bit.ly or other URL shortener. The are great because they can provide additional data such as click throughs, the date, and what kind of browser and mobile device your client was using when they clicked your link. 7. Take the opportunity to tag any friends in your page photos. Especially if the picture looks nice. This is the “human” part of facebook that creates to create necessary buzz to earn EdgeRank’s favor. Your post will have a much higher chance of getting off the ground if you involve real people and their experience with your product or service. Sell people the experience of the product, not your product. If you understand “why” people what they do and position your services invoke positive emotion around it; you’ll hit a facebook home run every time you make post. Seriously folks, Plan ahead and create photo opportunities around the experience of using your products and services in future business events. Take the opportunity to tag people using your products in your photos. 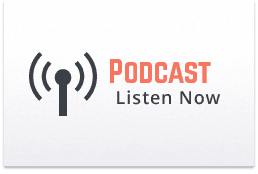 This will pay dividends for you over time. Be consistent though, this is a marathon not a sprint. 8. Mention other businesses, people or places in your post copy when applicable, use the last part of their URL with an @thispart from their page facebook.com/thispart to make a clean insertion into your copy. Don’t forget to add a location when applicable. 9. Use relevant #hashtags in the copy to create traffic to your conversation, this is extremely helpful if you linked your facebook to stream posts out to twitter. You can pass the unique features of your facebook hashtags into your Twitter feed and benefit both audiences, this isn’t my preferred method but many still do it. If you were making a post about the San Diego Chargers, you could structure your post copy to include these hashtags to give it a visibility boost without making it look cluttered. It’s short, sweet, and to the point. Don’t forget to add a photo! 10. Lastly and MOST IMPORTANT. 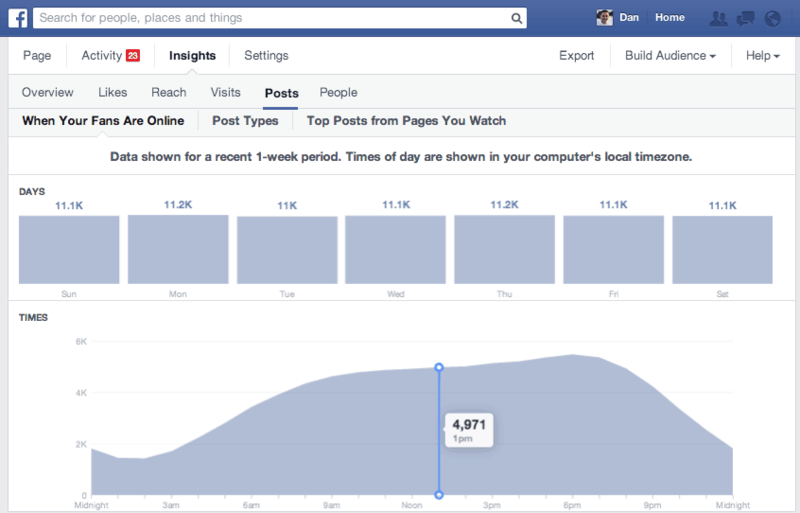 Post timing is huge, look at your facebook insights to determine when your audience is online. I like to schedule posts natively through my Facebook Page at those times to ensure my post gets the best chance of making it to my followers. For example, I know Tuesdays and Thursdays are always good days for post reach. In my line of work I’ll piggyback off popular weekly hashtags like #transformationtuesday and other popular hashtags like #tbt with relevant content for an added visibility boost. Lets take a step back and look at the strategy. If your company took the time to take a picture of a client, edit it, and post it with something nice to say; then tagged them in it so they can enjoy it too. The conversations that come as a result of your post in their inner circle of friends become your client tomorrow; Little things like this mean a lot to people. Social media pros like Gary Vaynerchuk of VaynerMedia and author of Jab Jab Jab Right Hook live by this philosophy, and I do to. We’re both successful in our own right because of it. Lastly, Be considerate. If someone takes the time to comment on your post, ask a question, or otherwise engages with your post or page; act as the page, say thank you or answer their question; apologize where appropriate. Be there for your facebook tribe, and they’ll be there for you. Please leave any comments below. I’d love to hear your feedback or other tips.